So you want to be a literary translator . . .
. . . but don't know where to start? Here's what you need to know. Literary translators come from a multitude of backgrounds. Many are authors first of all, for whom translation is a natural extension of their work. Others are literary critics or academics, who translate to give a wider audience access to the works they study. With the growing popularity and visibility of global literature in the English-speaking world, on the other hand, has come increased visibility of literary translation as an art of its own. As an American high schooler, I knew I wanted to translate books. But unlike my friends who wanted to be writers or performers, editors or scientists, I had no idea how to make that happen. I fumbled my way through, doing plenty of research and seeking out guidance from people in the translation industry wherever possible. I now work as a full-time translator on a combination of literary and non-literary projects, something I wouldn’t have believed possible at the age of 17 or 18. The first hurdle I faced was that there are very few undergraduate-level programs in the US (or the UK) where translation studies make up a significant portion of the degree. I ended up attending Wellesley College in Massachusetts, partially because they offered a flexible Comparative Literature major which allowed me to study abroad, take language and literature classes, and pursue a few independent studies on the topic of my choice. This turned out to be a good decision and is what I would recommend to aspiring literary translators in high school. The breadth of literary knowledge and the language skills which can be gained through a Language and/or Literature degree are invaluable for a literary translator. If you are in this position, definitely take any translation classes your university offers, and study abroad if possible to immerse yourself in a source culture and improve your language skills. Independent studies and undergraduate dissertations or capstone projects also present a good opportunity to integrate translation into your studies and to start building your portfolio of work. When I graduated from Wellesley, I felt I had the language skills and literary chops to start translating professionally. What I still lacked, however, was mentorship and a sense of how to “break in” to the field. I eventually decided that an MA in translation was the best way for me to consolidate my skill set and get the concrete guidance I needed to begin my career. Like most artistic vocations, working as a literary translator in theory requires no formal qualification. Anyone with a good command of two languages and a writerly inclination can give it a shot. But a masters-level degree in translation is the fastest, most focused route into the profession. This is true whether you are coming straight out of undergrad like I was, or you left full-time education long ago and are looking to make use of your language skills in a new way. A good translation masters offers you the chance to learn specialized techniques and theories while producing a sample body of work and networking within the translation community. In my experience, the degree also lends legitimacy to your translator’s CV and will open doors early in your career, especially if you lack a significant portfolio of published translations. Translation masters vary widely, so if you take this route it’s important to pick one that fits your needs. Some will focus much more on the business and technical side of translation, or include interpretation (oral translation) classes. Some support students who wish to undertake a work placement or internship in the translation industry. Most offer a limited selection of source languages (all programs in the US and the UK support English as a target language). They can vary from nine months to two years in length, and be classed as an MA (Master of Arts), MS/MSc (Master of Science), MFA (Master of Fine Arts), MRes (Master of Research), or MPhil (Master of Philosophy, usually the first one-to-two years of a PhD program). As a general rule, MA and MSc courses are more practical and include more taught elements, while MFA, MRes and MPhil courses are more theoretical and research-based. As a side note, a degree is not the same thing as becoming a certified or sworn translator, something which falls under the purview of professional associations like the ATA (American Translation Association) in the US or the ITI (Institute of Translation & Interpreting) in the UK and usually requires you to sit a series of exams and/or submit an application to the appropriate body. The first thing I did when looking at programs was to make sure that they supported both French and Spanish (my source languages), and to check that the faculty members’ specialist areas resonated with my literary interests (broadly, contemporary post-colonial or de-colonial texts). I also narrowed my search to English-speaking countries. Translation is usually (although by no means exclusively) done into the translator’s mother tongue, and the quality of my writing skills in English are just as important as my understanding of French and Spanish. While studying in a source-language country is a great way to improve language skills, it wouldn’t necessarily help me break into the world of professional English-native-speaker translators. I was also clear on exactly what I wanted to get out of the program. Literary translation doesn’t generally pay well, especially in English-speaking countries. Interpreting and so-called “technical” translation, on the other hand, can be reasonably lucrative careers. I wanted to keep my options open, including both translating literature and potentially working in language services full-time after graduation. 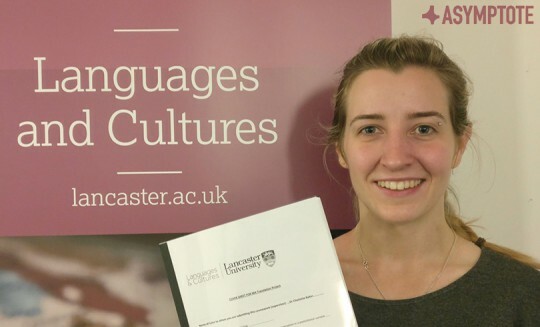 Because of this I chose Lancaster University’s MA in Translation, a more vocational program which spent about 50% of class time on non-literary translation and gave me the practical skills to translate and/or interpret for a living. If, on the other hand, you just want to work with literature, you may prefer a program which lets you spend more time working on independent translation projects and has a stronger theoretical focus. Having finished my MA in Translation about a year ago, I can honestly say it was an excellent decision. The skills and network that I built there are directly responsible for the fact that I am able to make a living using my languages, which in turn has allowed me to keep working on my literary projects. I also have a good understanding of what it will take to get a book-length literary translation published, something that now feels like a feasible goal rather than a pipe dream. While the path I took is by no means the only way to become a translator, I hope that I can provide some insight and guidance to anyone who dreams of bringing more wonderful global literature to the English-speaking world. Luckily, translation and global literature are gaining respect as a fields of study and there are new translation programs popping up every year in the US and the UK. Check out PEN’s list of programs with a literary translation component in the US and Iolante’s guide for the UK. These range from undergraduate classes to PhDs in translation and everything in between. These lists are not exhaustive and new programs open nearly every year, but they are an excellent starting point for your own research. Proz.com is another good resource for anyone interested in translation as a profession, and keep reading publications like Asymptote to stay on top of the international literary world! Emma Page is a freelance translator of French and Spanish living in the UK. Originally from Seattle, Washington, her passions include bookstores, Quebec, and traveling Europe in her camper van. She has been a communications manager for Asymptote since 2017. I’m a full time freelance translator currently working on my first novel. People who want to get into the literary translation profession need to know one very important thing: it isn’t really a profession. The number of people making a full-time living from this is miniscule. I would wager there are less than 100 full time professional literary translators around the world. I might be off, but I’ve been to the American Literary Translators’ Association conference, which is attended by about 500 people each year, and I don’t know if any of them were making their living full time from this. They all have academic jobs, work for some journal, or do freelance editing and writing. There are other professions that grant prestige and allow for some degree of creative expression that numerous people want to get into – I’m thinking of acting, for example. How many A-list stars are there in the world? A couple hundred? Yet it’s not like your education in theater or acting or whatever goes completely to waste if you don’t make it into that highly select group. You can do commercials, you can do independent films, etc. Yet I have the feeling that people who do literary translation degrees are hoping to make it into an exclusive club that has so few members it can hardly even be considered a club. I think it might make more sense for people to study a foreign language and do a creative writing degree, or just find a mentor outside academia, but knowing all the while you really can’t make a living from this. If you do manage to do it, you’re not joining a club – you’ve just created one. Hi Mike! I think this is a really valid point. You’ll notice that I do mention that “Literary translation doesn’t generally pay well, especially in English-speaking countries.” You’re definitely right that very few people make a living exclusively translating literature. I certainly don’t, and don’t imagine I will soon. On the other hand, I think one can “be” a literary translator while doing something else to pay the bills, whether that’s a more technical kind of translation or something else entirely. The difficult financial reality of literary translation is exactly why I make a point to emphasize the various kinds of degrees available, some of which give you other more “marketable” skills, and some of which are best suited for folks who will not be relying on the degree to result in a full-time income. In my personal experience, I have not found that literary translators are interested in forming any kind of “exclusive club” whatsoever. They tend to be a very supportive group, equally welcoming of folks who have an “official qualification” and folks who come from another background. A degree won’t be the right answer for anyone, and I wouldn’t suggest taking on debt with the idea that you will pay it off by translating books, but it can be a very helpful and focused environment in which to refine a skill set! I think they are fairly similar to creative writing MFA’s in that way. Most folks who write fiction do something else as well, but I don’t take issue with them calling themselves “writers” or “novelists” just because that isn’t their main source of income.